Author Tom Zidik’s new memoir, “Riding This Electron Hanging on for Dear Life: A Soul Searcher’s Theory of Everything” (published by LifeRich Publishing), reveals the life of a “soul searcher” as Zidik journeyed from boyhood to manhood, contemplated his place in the universe and eventually learned to embrace his uniqueness. As a young man, Zidik says life-changing events forced him to question his existence; “Riding This Electron Hanging on for Dear Life” shares his findings upon examining his reality. It presents his theory of everything, along with him growing from a child to adult that includes his journey towards becoming spiritually successful and physically and financially sound. Tom Zidik is from central Pennsylvania and is a retired manager in the manufacturing industry. He and his loving wife of 42 years live in a semi-secluded setting where they enjoy the wildlife and the peace of solitude. 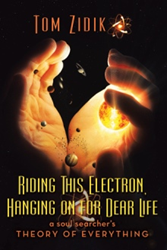 “Riding This Electron Hanging on for Dear Life” is his first book. More information is available at: http://www.tomzidik.com.